Hello everyone! Well, after many many hours of designing and programming, my new home is ready. I hope you all enjoy the new site as much as the old one. Grab yourself a cup of tea or coffee and have a browse. You'll find old favorites and new content, as well as a free short novella: The Only Star as a thank you for all your awesomeness. I had lots of fun writing that little story, so I hope you enjoy reading about Remi and Hawk's latest shenanigans. At the moment it's only available to read on the website, but I promise I'm working on getting it downloadable in various formats. I also had a great time creating the cover. Over the next few months there will be plenty more added to the site, and I'll make sure to update you when something new goes up. For those of you not on Facebook or Twitter, I've added the feeds to my blog sidebar so you can follow along if you fancy. The site's been checked over and over, but sometimes things slip through the cracks, so if you come across any broken links or maybe just something I've missed, please let me know. If there's anything you'd like to see more of, you're always welcome to drop me a line. I know there's a lot going on so I don't plan on shuffling too much about so folks can get used to where things are. On the sidebar you'll find the schedule for upcoming guests, as well as where I'll be blogging, any contests, blog hops, and giveaways coming up. I'm also still getting my head around the site's new layout and functionality, so I do apologize if things are a little slow going at the start. Anyway, on to the fun stuff. To celebrate my grand opening, I'm having a giveaway. $10 Amazon Gift Card, a handmade vintage-style journal with their name on it, and an author goodie bag with all sorts of swaggy treats. All you have to do is leave a comment on this post, along with your email address. If you don't want to leave your email address, you can enter the contest via the Contact Form. If you fancy following my swanky new blog, that would be treat, but it's not a requirement. Saturday, March 16th at midnight (eastern time). So what do you think of the new digs? Hello all! 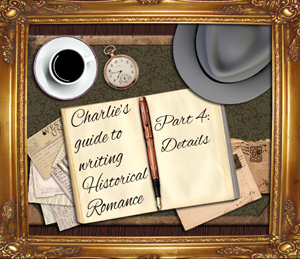 Welcome to part 5 of my series on writing historical romance and the final installment. The last four weeks we've covered: character, atmosphere, setting, and detail. When you gay put it all together it might seem daunting, but the more you work at it, the easier it gets. If you want authenticity, it's very important to do your research. Don't forget to look up timelines if you're going to mention a specific brand, event, or style of fashion. Clothing, speech, frame of mind, architecture, music, movies, technology, all lend a hand in creating authenticity. Modern phrases will jolt readers out of the story, so keep a lookout for those. When naming your characters, give them appropriate names of the time. Think about how they dress and if it fits in with their social standing. What about their level of education? Their background? Family history? Think about society and the way it's had a hand in shaping your character, how it continues to shape them, and what it means for the relationships they have with others. Use references such as movies, books, and photographs to help you with setting, fashion, and speech patterns. Read books written during that period for a sense of voice. Remember that you can't hold your characters up to the same standards as today's modern thinking individual. Where certain situations plausible then? Create atmosphere by describing more than what your character sees. Immerse your readers with a feeling of depth using your other senses. Like with any well-written book, research is always required. Granted that with historical, it usually involves a great deal more, but if you enjoy getting lost in an era long gone, writing in this genre will feel wonderfully satisfying, not to mention you'll have fun too! Hope these posts have been of some help to folks. If there's anything I didn't cover or you're uncertain of, feel free to leave me a comment or drop me an email! Happy reading! Hello all! Welcome to the fifth installment of my writing series on Gay Historical Romance. Today we're talking a little about details, something which makes a huge difference in a historical. I love to put details in my stories, but I also like for them to be subtle. Sort of like background scenery in a movie. The details are there to add to the story and its authenticity, not to distract. By now I know a good deal about the periods I write in, so if I have a scene where let's say the characters are listening to the radio, I'll know what sort of brands were around at the time, what radio programs were on the air, and have even listened to a few myself or read a transcript or three. The scene isn't about what they're listening to unless it's an important news flash or presidential speech, so I don't want the focus to be taken away from what's happening with the characters, I just want to create an image in the reader's mind. Even if it's only in passing, naming a specific program or having snippets from an actual transcript will lend authenticity to the scene. It should all blend seamlessly together rather than shout out, "I did research!" Take this scene from When Love Walked In where Bruce finished work for the evening and crosses the street to his favorite cafe. "Hey Joe, what do ya know?" Bruce greeted the handsome blond with a wink as he set himself down at the counter. Apple'n Pies had the best pies in New York City, and Joe was the godsend who made them. "How's it going, Bruce?" Joe replied with a bright smile, chuckling when Mittens meowed for his attention. "I'm sorry, sweetheart. Hello to you too." He gave her a little scratch before reaching under the counter and placing a large, brown paper bag in front of Bruce. "One roast beef sandwich with extra roast beef, a side of potato salad, one slice of pie, one coffee—easy on the creme, and a reminder to go to bed before sunup." Bruce glowered at him. "Gladys called you, didn't she?" "You bet," Joe laughed. The phone rang, and he gave Bruce a wicked grin. "I'll bet you five dollars that's her calling to make sure you're taking home more than just pie." "Five dollars? Who do you think I am, Rockefeller? I ain't got that kinda bank to lose." Bruce said his goodbyes and high-tailed it out of there before he got another earful. Now this is a very short scene, but it required research nonetheless. What Joe gives Bruce for dinner had to be looked up. I wanted a common, full, but inexpensive meal a fella like Bruce would go for. Being a private investigator, he doesn't exactly make a mint. He's not going to go down to a restaurant for dinner and if he did go somewhere it would probably be an automat or cafe. Coffee is essential for any detective, and pie is non-negotiable for him--as brought up by his secretary earlier in the story. I could have just had Joe hand him a paper bag with some food, but having it be a pretty popular meal of the time adds that little bit extra. Also it says something about Bruce and the time he is living in regarding the bet. $5 for Bruce would be $87.63 for us now. Times are tough to be making bets you know you're going to lose. Dollar Times.com has a handy inflation calculator. When I'm writing, I'm constantly pausing to look up the term for something, a particular brand, or a visual so I can get the description right. If it's something I need to come back to later because I don't want to break my stride, I place a *, which to me stands out and tells me research is to be inserted there. My first drafts are full of these little stars. I also use (these fellas) and then type a quick description of what I need so I don't forget when I come back to it later. For details, I tend to refer quite often to particular music, songs, movies, clothing, food, prices, sports, technology, consumer products, reading material, cars, brand names, pop culture, communication, and so on. I also make certain to use the correct term for the item at the time as well. Lisa's Nostalgia Cafe offers a great source of every day life items for referencing, including jobs. There were a lot of positions back then that are either uncommon now or no longer around, such as cigarette girls, soda jerks, and telegram delivery boys. If one of my fellas goes to a drug store, it's going to be completely different to the drugstores of today, offering flavored soda water, malted milkshakes, juice, and more. Maybe he's got a nasty headache and he decides to buy some Anacin. So he walks down to the nearest drug store. Let's say that drug store is similar to the one pictured here. While my fella walks in to do whatever he's going to do, I would integrate a brief description of the place. Size, the black and white tiled counter, the chrome and red leather stools, how airy and bright it is, maybe how new, clean, or modern it is compared to his usual drug store down on 12th, the people sitting enjoying a meal, the person who serves my fella. The ten cents he pays for a glass of orange juice, and what the hell, he'll have a slice of pie, too. Maybe as he walks in while the song, "You've Got What Get's Me" floats up from the radio behind the counter, and just then the soda jerk looks up, holding our hero's gaze slightly longer than he should. I'm a fan of placing a line from a song or two in my books. The songs are always relevant to the year and the story. I always look up the lyrics of the song to see if it fits with what's happening with the character(s). Research the architecture of the time as it would influence a lot of the interiors. In the 1920's Egyptian themes were popular, in the 1930's Art Deco was everywhere, consisting of specific materials. There was a lot of chrome about, certain color schemes, and shapes. Remember not everyone kept up with the times and you'll have different generations which may mean using brands or songs from much earlier. Conclusion: Details are important, but remember they're there to add authenticity to your story, not to distract. Things such as brands, architecture, pop culture should be blended seamlessly throughout your story depending on what your characters are doing, rather than being pointed out. Readers will know how much research went into your book by the way all the elements come together. Next week is the final installment of the series. Part 5: Conclusion, putting it all together. Thanks for dropping by! Babes in Boyland 2nd Annual Valentine's Day Lovefest! Hello everyone! The Babes in Boyland Valentine's Day Lovefest is now on, and there's an array of fantastic prizes to be won from a host of publishers and authors, including me! So make sure to drop by and leave a comment on their post for a chance to win! There's all kinds of ebooks and goodies to be had, so don't miss out! And what's Valentine's Day without something sweet and romantic to read? My Valentine's Day short story When Love Walked In is about a grumpy detective, his best gal friday--who happens to be a cat, and the Valentine's Day surprise that changes their lives.